Receipt validation helps you prevent users from accessing content they have not purchased. It is best practice to validate the receipt at the point where your application’s content is distributed. Local validation: For client-side content, where all content is contained in the application and is enabled once purchased, the validation should take place on the target device, without the need to connect to a remote server. Unity IAP is designed to support local validation within your application. See Local validation below for more information. Remote validation: For server-side content, where content is downloaded once purchased, the validation should take place on the server before the content is released. Unity does not offer support for server-side validation; however, third-party solutions are available, such as Nobuyori Takahashi’s IAP project. If the content that the user is purchasing already exists on the device, the application simply needs to make a decision about whether to unlock it. Unity IAP provides tools to help you hide content and to validate and parse receipts through Google Play and Apple stores. Receipt validation is performed using known encryption keys. 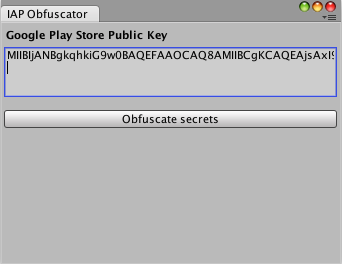 For your application, this is an encrypted Google Play public key, and/or Apple’s root certificate. If a user can replace these, they can defeat your receipt validation checks, so it is important to make it difficult for a user to easily find and modify these keys. See in Glossary > IAP Receipt Validation Obfuscator. This window encodes both Apple’s root certificate (which is bundled with Unity IAP) and your Google Play public key (from the application’s Google Play Developer Console’s Services & APIs page) into two different C# files: AppleTangle and GooglePlayTangle. These are added to your project for use in the next section. Note that you do not have to provide a Google Play public key if you are only targeting Apple’s stores, and vice versa. Use the CrossPlatformValidator class for validation across both Google Play and Apple stores. You must supply this class with either your Google Play public key or Apple’s root certificate, or both if you wish to validate across both platforms. Receipt authenticity is checked via signature validation. The application bundle identifier on the receipt is compared to the one in your application. An InvalidBundleId exception is thrown if they do not match. Note that the validator only validates receipts generated on Google Play and Apple platforms. Receipts generated on any other platform, including fakes generated in the Editor, throw an IAPSecurityException. If you try to validate a receipt for a platform that you haven’t supplied a secret key for, a MissingStoreSecretException is thrown. bool validPurchase = true; // Presume valid for platforms with no R.V. // Unity IAP's validation logic is only included on these platforms. // On Google Play, result has a single product ID. // On Apple stores, receipts contain multiple products. // Unlock the appropriate content here. It is important you check not just that the receipt is valid, but also what information it contains. A common technique by users attempting to access content without purchase is to supply receipts from other products or applications. These receipts are genuine and do pass validation, so you should make decisions based on the product IDs parsed by the CrossPlatformValidator. Different stores have different fields in their purchase receipts. To access store-specific fields, IPurchaseReceipt can be downcast to two different subtypes: GooglePlayReceipt and AppleInAppPurchaseReceipt. // This is Google's Order ID. // because Google's sandbox does not provide Order IDs. See in Glossary App receipts from version 7.0 onwards, not Apple’s deprecated transaction receipts. The AppleReceipt type models Apple’s ASN1 receipt format. See Apple’s documentation for an explanation of its fields.